Please join us. Register today. There's a seismic shift happening in cyber security. Integrated platforms are the future. Join us for a webinar to hear how Symantec and our partners are working together to drive down the cost and complexity of cyber security, while protecting enterprises against sophisticated threats. 2019 is poised to be a year of disruption. Artificial Intelligence (AI) is entering the cyber battlefield, with increased regulatory activities and many other developments for enterprises to further their digital transformation efforts. These are but some of the many things that CISOs must keep up with. What should be the key areas of focus and considerations for CISOs in developing their organisations’ security posture? What should be top in their list of priorities for this year and beyond? Join Nick Savvides, Symantec Chief Technology Officer for Asia Pacific, as he shares the top considerations and priorities that CISOs need to focus on. Today’s threats aim to do more than just steal intellectual property. They hijack software updates, destroy devices, steal resources, and take advantage of trusted tools within your network. To top it off, these threats are notoriously difficult to detect. Join leading threat expert, Kevin Haley, as he shares insights on trends shaping the threat landscape and how to best-protect your organization. Employees are increasingly remote and mobile, and they need access to cloud applications. Traditional concepts of network security are fading away. Organizations are turning to cloud-delivered security services that offer complete, "Direct-to-Net" protection. But not all service providers are the same - and the stakes are high. If you are looking at cloud service solutions to simplify your network security infrastructure while improving performance, be sure you make the right choice. What will the webinar address? - How to plan for security in the move to the cloud? - How to protect your users from an evolving threat landscape? - How to make sure your data is secured and maintains compliance with legal regulations? - How to effectively manage new types of devices and your mobile/remote users? 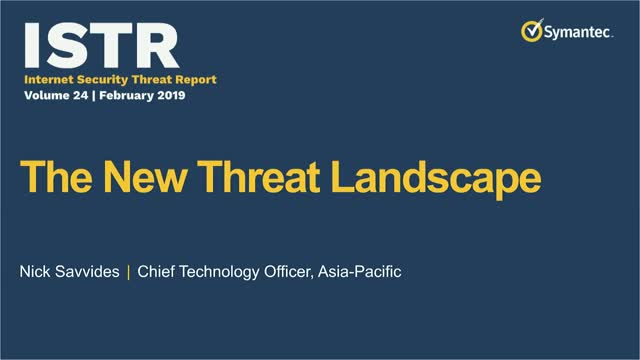 The threat landscape is ever changing. New threats are rapidly evolving with increasing sophistication, leveraging new and advanced technology. With the new year being just around the corner, how can we be prepared for the shifting threat landscape? Join Dr. Hugh Thompson, Symantec Chief Technology Officer in our webinar, as he shares his thoughts on Security Predictions in 2019 and beyond. Based on insights gathered from our intelligence, he will touch on new trends that will likely take the limelight in the coming year. Attend our webinar. Learn what to expect and be prepared in your security posture for 2019. In the eyes of cyber criminals, there are few targets more lucrative than healthcare organisations due to the comprehensive nature of the information held by them, and the high value of health data on the black market. And, it is not just about protecting information – cybersecurity incidents in healthcare can also impact hospitals' ability to deliver care, or could result in harm to patients should critical systems get taken down by a malicious actor. Let us show you what’s new and how our solutions will give you the most complete visibility, data security, threat protection and compliance management for your public cloud services with integrated cloud security. •.New Integrated Compliance Management for IaaS – the first Cloud Security Posture Management (CSPM) solution integrated with Cloud Access Security Broker (CASB) and Cloud Workload Protection Platform (CWPP) offering detailed compliance remediation. •. Fastest Acting Cloud App Security – the first API-based CASB that can remediate security issues in seconds, with new Fast APIs for Microsoft and Box. •. Broadest & Deepest Cloud App Coverage – CASB data security and threat protection for any cloud app, including custom apps. •. Best DLP and Threat Protection for IaaS Storage – Gartner Magic Quadrant leading Data Loss Prevention (DLP) and threat protection now integrated with Cloud Workload Protection(CWP) and Gartner Magic Quadrant leading CloudSOC CASB. Attend this webinar to hear the advice from experienced security professionals who have successfully navigated the path to protect their businesses from mobile threats. By the end of this webinar, you will have gained important advice and perspective from those who have gone before you and are able to sleep better at night. The releases of Symantec IT Management Suite 8.5 and Ghost Solution Suite 3.3 are here! Please join us for a special webinar on Tuesday, December 4 to learn all about these exciting new solutions. We will discuss and demo some of the cool new features in IT Management Suite 8.5 such as time-critical management, endpoint quarantine, and automated vulnerability remediation and in Ghost Solution Suite 3.3, the new web console, smart wizards, and much more! Don't miss this great opportunity to get the latest information on IT Management Suite 8.5 and Ghost Solution Suite 3.3! With the potential for energy savings, improvement of business processes, automation of the supply chain and more, organisations around the world are giving IoT a serious look - but security concerns are proving to be a barrier for adoption. With most IoT devices and platforms missing even basic security hygiene and existing network security tools lacking the capability to properly manage an IoT network, implementing IoT devices can be a security nightmare. Join us in our upcoming webinar as we discuss the current state of IoT in enterprises, the challenges of properly securing IoT devices, and our top recommendations on how to resolve these challenges and prepare your organisation for the age of automation. Advanced phishing attacks and ransomware continue to plague Organizations with a 55% increase according to Symantec threat research. Users continue to be easily social engineered into opening phishing emails which can steal confidential data like credentials. In addition, email continues to be the number one vector for malware including ransomware. Combating these insidious threats requires a powerful combination of advanced protection and user security awareness. This webinar introduces email threat isolation, a paradigm shift in the fight against phishing attacks and ransomware. - Pre-empt phishing attacks with real-world simulations and built-in user security awareness tools, tracking readiness over time. - Anticipate future campaigns with comprehensive security analytics gathered from previous attacks against your organization. - Fully secure your Office 365 or Google G Suite apps with integrated DLP and CASB for both advanced data and threat protection. In addition, we will show you Symantec Email Threat Isolation, in action, with a demo that showcases safe rendering of links. Data, devices and employees are mobilised and traffic is increasingly going to the internet and cloud applications. Traditional approaches to network protection are going away as the concept of a secure perimeter disappears. In this webinar, we'll look at today's new business paradigm, the challenges we now face, along with best practices for building a secure network in the cloud. Join Dr. Hugh Thompson, CTO of Symantec, and Mark Urban, VP Product Strategy & Operations, Symantec, as they share their vision for Cloud Generation Network Security and how they see leading companies of all sizes prepare for the future. • A security insider's view of market trends and the 24/7/365 demands of a distributed workforce. • The increased complexity of managing full security stack with limited resources. • The technical challenges of securing cloud applications. • Cloud solutions that solve cloud problems. It promises to be an insightful event for all security, network and IT professionals. After their presentation, the speakers will also take questions from the audience. Watch a demonstration of two iPhone hacks - malicious profiles and malware (spyware) - to see how a hacker can take full control of a device, steal credentials, control and manipulate communications, steal identities and remotely record conversations without detection. In each case, see how Symantec Endpoint Protection Mobile (SEP Mobile, formerly Skycure), the leading Mobile Threat Defense solution, protects the device and data from these attacks. Businesses and Individuals, need to have clear visibility of the strength and application of their security controls, to protect their systems. Governance over the controls is as important as implementing the controls in the first place and understanding what the important controls are and how they need to be measured is vital. The ability to measure the application and effectiveness of cyber controls in a streamlined and automated way to allow effective decision making and remediation of issues is key to ensuring they are providing the protection required. Deloitte and Symantec are hosting a live webinar to discuss cyber governance and compliance challenges in Australia. Join this webinar for insights into cyber operations, business reporting and strategies for navigating the current landscape. Symantec Corporation (NASDAQ: SYMC), the world’s leading cyber security company, helps businesses, governments and people secure their most important data wherever it lives. Organizations across the world look to Symantec for strategic, integrated solutions to defend against sophisticated attacks across endpoints, cloud and infrastructure. Likewise, a global community of more than 50 million people and families rely on Symantec’s Norton suite of products for protection at home and across all of their devices. Symantec operates one of the world’s largest civilian cyber intelligence networks, allowing it to see and protect against the most advanced threats. For additional information, please visit http://www.symantec.com/en/aa/index.jsp or connect with us on Facebook, Twitter, and LinkedIn.